Home Sheducation Centre Gable and Skillion Roofs on Carports: How are They Different? Gable and Skillion Roofs on Carports: How are They Different? Carports are popular structures that serve as roofs over the owner’s automobiles. While every carport, by definition, serves this function, they may have certain characteristics that make them different. If you look at our options at Action Sheds Australia, you will see that our carports have two different styles of roofs: gable and skillion. While the differences aren’t too vast, it is useful to know the details of the two so that you can decide which one you would prefer for your carport. Gable roofs are ones that are slanted on both sides, allowing them to come to a peak in the centre. This is usually the preferred roof for carports for a number of practical reasons. Aesthetically-speaking, the peak can easily blend with the rest of the owner’s property, a house for example, because the roofs are similar looking. In addition, the twin slanted ends allow rainwater to easily glide off of it. The design of the roof allows for better airflow, which in turns keep the car cooler, not only because of the blocked sunlight, but also because the increased air circulation cools the car down. This is especially useful during the summer months. In contrast, skillion roofs are ones that are flat and come to no peak, although this is slightly misleading as there is a very slight incline to allow rainwater to fall into a gutter. This principle is one of the appeals of the skillion roof, because you can divert all rainwater into a single gutter and expel it where you’d like. However, the main draw of the skillion roof is aesthetics, as some people prefer the simple design of a flat roof and find the contrast to the rest of the property artful in its own way. Carport roofs come in two types, namely gable and skillion. Gable roofs have a point to them and slant on both sides while skillion roofs appear to be completely flat but with a minor incline for practical reasons. Either one would be great for your carport, so choose the one you’d like more. 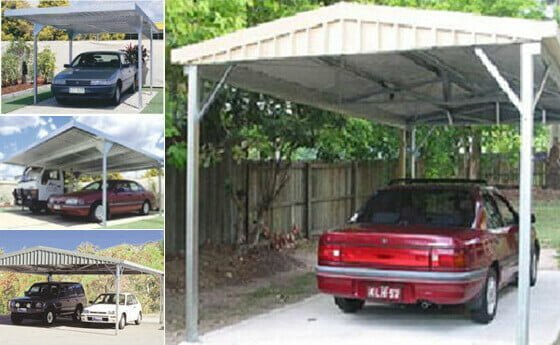 For more information on designing the perfect carport for you, please call 1300 778 628.